As the name implies, explainers are used to explain processes. They are a short form content that lasts for several minutes. During this time presenter will explain some main points about a topic. In most cases, this will be enough even for casual viewers. This is precisely the reason why explainers were made in the first place. In comparison to written articles which tend to get technical even if they’re really short, there is no way you can misunderstand this type of content. In other words, these videos can earn much more attention. As a result, it is much easier for them to go viral and thus, rank higher within Google and YouTube. The explainer video experts from Bread N Beyond have written a thorough guide with 14 types of animated explainer videos with some very interesting ideas. If you’re looking for hints and tips on the topic, their article is full of them. Why are explainers suddenly so popular? There are three main reasons why people are using the Internet: to get some quick info, to educate themselves and to be entertained. When it comes to education, there has always been various content on the web. SEOs have tried a lot of different approaches over the course of time. The issue with educational content isn’t its form, it isn’t even the information presented within. The issue is how to create something that people will actually read and learn from? For some time, ultimate guides ruled supreme. These humongous pieces created a “WOW” effect for all the readers. Influencers were more inclined to read them and subsequently, more inclined to link back due to the sheer size of content and the positive impression this article left on them. However, this wasn’t the only reason SEOs started creating these guides. Ultimately, even if content gets links and good response from other bloggers, you still have to satisfy majority of visitors. This is precisely what guides did as they provided all the info in one place. Due to this fact, people didn’t have to switch website and would spend a massive amount of time in one place. This sent a major, positive impact to Google showing it how dominant this piece actually is. Due to their enormous success, everyone started creating guides. The market was swamped and both influencers and readers couldn’t handle so many information all over the place. It created an opposite effect and people no longer wanted to do anything with them. Fast forward. After the downfall of guides, there was still a gap that had to be filled. So, instead of going for even larger content SEOs smartened up and started creating brief videos that would be interactive, up to a point and providing all the data person needed. 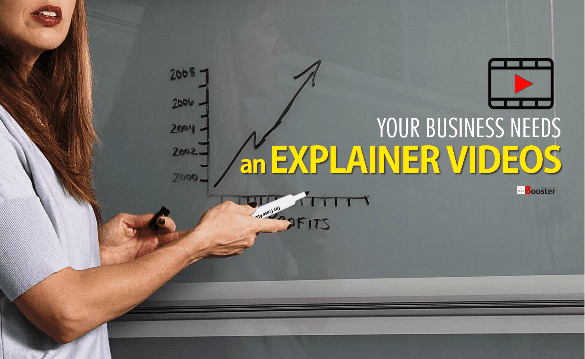 How can explainer videos help your website? There are numerous reasons why you should at least consider explainers. Let’s discuss them a bit further. Now you’re probably thinking: “Well, why don’t I start creating some other type of videos?” Here’s the thing. Explainer videos are probably the best suited for educational sites. In that regard, you probably should avoid them if you have for example entertainment website. Still, if you are trying to teach people something there is no better way of doing it than with explainers. Sure, you can create some other longer type of video content but it probably won’t convert as good. Oftentimes when you write something really specific, there will be terms that are hard to explain or would lead you away from the topic. Nevertheless, they are important for the article and the text may be difficult to understand without them. In those cases, it is best if you add an explainer nearby. This way, you can give a definitive answer and clarify some things while staying on the track. Also, have in mind that these videos can help you break down the text and create a better visual impression on a reader. We’ve already seen that this type of content has some potential. Simply put, both influencers and users are reacting positively to it at this point in time. How long will this persist it remains to be seen. Anyway, it is best for you to ride the way and get as much as SEO exposure as possible until it runs its course. Like with anything new within SEO industry it is something that can help you out at this moment in time. About the Author: Nikolay Stoyanov is a well-known Bulgarian SEO expert with 9 years of SEO experience. He loves writing about various SEO topics on his blog NikSto.com. Nikolay also offers 100% white hat SEO services, technical audits and is a trustworthy SEO outsource provider (niksto.com) to clients in various niches around the world.